During the winter time, I make sure to drink multiple cups of tea a day. 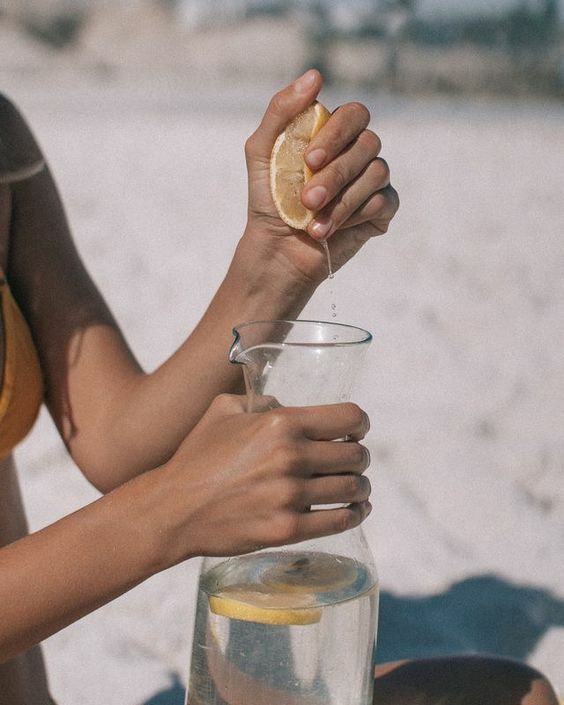 When summer rolls around, I like to transition to lemon water. Not only is it totally refreshing, there are a multitude of health benefits associated with drinking lemon infused water. This year, I asked myself "is there anything I can add to my lemon water to make even more nutritious?" It wasn't long before a bunch of ideas started running through my mind. He's what I've come up with so far. The first lemon water booster that came to mind was the addition of trace mineral drops. For those who aren't familiar, you can purchase essential minerals in liquid form. Just add a drop or two to your water and suddenly you're raised the nutritional level of your beverage. Best of all, it doesn't alter the taste of your drink at all. Some of the wonderful benefits you can experience from consuming adequate minerals is improved bone and joint health. Minerals also help our bodies to assimilate other vitamins we consume. Most people don't talk about it but trace minerals are also essential for healthy hair, skin and nails. Prior to purchasing trace minerals on Amazon, I checked out some of the reviews and several of the happy customers spoke of improvement of hair health thanks to the addition of absorbable minerals. A few years ago I stumbled an amazing summer tonic in the form of liquid chlorophyll. These forest green drops have the power to detoxify internally in a major way. During the warmer months, I like to aid my body in it's detoxing process. After learning that chlorophyll drops had the power to reduce/eliminate body odor from the inside out, I decided to drink some every day during the summer. I've since run out and replaced the bottle because I love the stuff! Chlorophyll helps improve my digestion while it oxygenates my blood from the inside. This summer, I'm experimenting with adequate chlorophyll intake combined with using skin acids on the underarms to help manage odor. The other day, I added a few drops to my lemon water to enhance the detoxing and alkalizing qualities. This is going to be my new thing going forward as part of a daily detox initiative. Lemon water and cucumber are a perfect combination. Not only does it taste yummy but adding organic cucumber also raises the nutrition level of your water. They contain vitamin A, C, K, beta-carotene, sulfur, and B6. They also contain a flavonoid called fisetin which has been shown to help improve brain function. Adding cucumbers to your lemon water only enhances the diuretic effect making it a great tonic that fights against bloat. If drinking plain lemon water isn't your thing, try adding cucumber to increase your desire to drink it. A couple of years ago, I frequented a place that offered free lemon cucumber water. I consumed so much of it because I absolutely loved the taste. It wasn't long that I experienced some added benefits of my daily habit like weight loss. Also, my husband noticed that I had a mild citrus scent after working out. To me, that's a much better benefit than just drinking plain water. If I really want to amp up the beauty benefits of my lemon water, I need to lace it with collagen. Hydrolyzed collagen is tasteless, odorless and dissolves easily in water. Best of all, collagen pairs wonderfully with the vitamin C content in both the lemons and the cucumber to help our bodies synthesize its own collagen formation. Imagine drinking a tasty lemon water drink that also has the ability to keep your skin firm and plump. Let's not forget that collagen is also necessary for thick hair and strong nails. By adding this beauty powder to your lemon water, you're taking everything to the next level. This year, I want to experiment with adding liposomal vitamin C to my lemon water just to really push the boundaries of how to create the ultimate beauty tonic. As you might recall, liposomal C is the ultra-powerful, ultra absorbable version of your typical vitamin C vitamin. Some people marvel at its ability to give you glowing skin from the inside out. I've read countless testimonies on how adequate vitamin C intake can really transform the glow factor of your skin. Since writing my original post on the vitamin C and skin connection, I happened to be on an Instagram live video where a beauty influencer was asked about her skin tips. Quickly she mentioned one product that say claimed was the sole reason for her glow. After looking it up, I realized that her holy grail contained a high vitamin C content. That explained why she noticed such a huge difference. Typically, most of us are thinking about vitamin C during the winter months to stave off colds. I'm here to remind you that it's a perfect summer glow vitamin as well. I love your blog. Keeps me in the know!